Two Democrats And One Republican Trustee Team Up In A Bipartisan Effort To Save College Students Over $100 Million Dollars In Waste On Measure M Bond Funds. (COSTA MESA, CA) – The Associated Builders and Contractors (ABC) are proud to announce the defeat of plans for union discrimination on the largest California community college bond passed by voters in 2012. 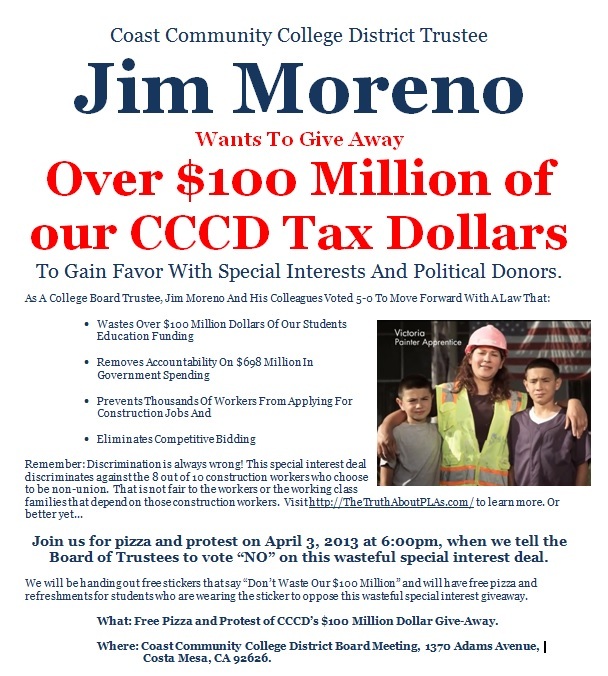 Two Democrat Trustees and one Republican Trustee joined together in a bipartisan effort to save college students over $100 million dollars in waste on the $698 million dollar Measure M bond passed in November 2012 at Coast Community College District (CCCD.) After months of controversy regarding the virtual union monopoly, called a Project Labor Agreement, the CCCD made its final vote on the issue at the May 15, 2013 meeting. They wisely decided that a PLA will not be used for construction projects on Measure M projects. “I want to commend Trustees Prinsky, Grant and Hornbuckle for this brave show of bipartisanship that will save students and teachers over $100 million dollars,” said Susan McNiel, President of the Associated Builders and Contractors of Southern California. “A wasteful PLA on the Coast Community College District’s Measure M bond funds would have discriminated against 8 out of 10 construction workers. It would be tough to get local workers on the project if we eliminated over 80% of the market from consideration.” The PLA was discovered by Labor Issues Solutions’ Kevin Dayton buried in an online agenda for a special meeting and disguised as a “Continuity of Work Agreement.” The Associated Builders and Contractors of Southern California (ABC So-Cal) and its coalition partners immediately jumped into action to inform the public about the wasteful and discriminatory nature of these project labor agreements. As reported in the Daily Pilot and the Huntington Beach Independent, at the Trustees’ March 6 Board meeting, CCCD Trustees were given a quick lesson in PLA politics during testimony from the Coalition For Fair Employment (CFEC), the Associated General Contractors (AGC) of California, Associated Builders and Contractors of Southern California and Huntington Beach Mayor Pro-Tem Matt Harper. A letter was read into the record from Alfred Dennison from Dennison Electric, Inc. who has done quality skilled work on past school projects and saved the district thousands of dollars. Mike Holton with Gould Electric was also in attendance opposing the PLA at CCCD. The coalition against the PLA also included the OC Taxpayers Association, who were told in writing that there would not be a PLA on the bond; the Costa Mesa Taxpayers Association; and the Orange County Business Council. Since public awareness of the special interest deal known as a PLA was so low, ABC So-Cal worked with local college students to drop literature about the PLA on campus and sent out over 30,000 robo-calls to taxpayers in the district from our local taxpayers association, State Assemblyman Allan Mansoor and Huntington Beach Mayor Pro Tem Matt Harper. Working with local reporters, ABC So-Cal was also able to get an editorial against the PLA, the day of the April 3, 2013 vote on the CCCD PLA, in Orange County’s major newspaper The Orange County Register on the front page of the local section. ABC member, Alfred Dennison from Dennison Electric was highlighted. “Jim Moreno and Jerry Patterson tried to deceive the voters and give a special interest deal to their political donors by pushing this virtual union monopoly. OC Tax and OC Business Council gave their endorsements with the understanding that no PLA would be used. The bond was passed using those endorsements in the campaign mail to voters – and it won by 57% when the bond required 55% for passage. You could easily say that without those endorsements, the bond would not have passed,” said ABC Government Affairs Director, Dave Everett. “Prinsky, Grant and Hornbuckle deserve all the credit for ensuring that promises made were promises kept.” The two Democrats that were pushing this virtual union monopoly are Jerry Patterson and Jim Moreno. A quick look at past campaign finance documents reveals Jerry Patterson’s long career funded by the very same unions he looks to give preference to – both as a Trustee and Congressman. 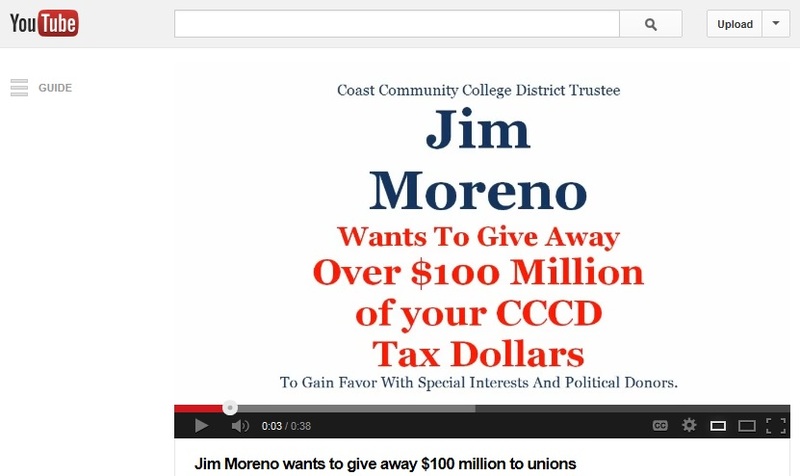 The other, Jim Moreno, apparently wants the unions to fund his campaign to take John Moorlach’s Orange County Supervisor seat in 2014. Associated Builders and Contractors (ABC) is a national trade association representing 22,000 members from more than 19,000 construction and industry-related firms. Founded on the merit shop philosophy, ABC and its 72 chapters help members win work and deliver that work safely, ethically and profitably for the betterment of the communities in which they work. For more information, visit www.abcsocal.org. Excluding the Anaheim TOT mail (which has nothing to do with the June election), I received my fourth mailer of the primary election cycle on Tuesday. The first mailer was from Congressman Ed Royce’s campaign on April 4, the second one was from Todd Spitzer’s campaign for the Third Supervisorial District on April 19, and the third one was another Royce piece on April 28. This mailer is the second I’ve received from Spitzer’s campaign, and the fourth I’ve received from any campaign this cycle. The piece describes Spitzer’s pension reform proposal. The other side of the exterior portion has the headline “Taxpayers Support the Todd Spitzer Pension Reform Plan” and a quote from Reed Royalty regarding Spitzer’s endorsement by OCTaxPAC (Orange County Taxpayers Association PAC). It also includes the Orange County Register logo along with a statement that “Spitzer’s Plan was Published” in the paper on April 6. Spitzer’s name is mentioned thrice, reinforcing his name ID even among voters who won’t open/read the piece and who received the piece in the mail with the address/postage side face down. The interior also highlights Spitzer’s motto from his brochures: “Integrity. Experience. Results.” It also repeats his endorsement by the Orange County Taxpayers Association. The piece is 8.5″ x 11″ and becomes 17″ x 11″ when opened up. Click on the picture to view a larger version.